The Hot Weather in Tamil Nadu will take a mini break for a few days as synoptic activity takes stage over the region. As mentioned in our post on Saturday an evolving disturbance in South Bay is likely to trigger the return of rains to Tamil Nadu this week bringing in milder weather conditions along with it. As the trough moves closer to Sri Lankan coast around 2nd March the rainfall intensity is likely to improve. With models estimating the trough to remain a weak disturbance through its life cycle it will possibly restrict the heavier rainfall possibilities to South TN and delta districts. A few places along the Western Ghats in Tirunelveli, Kanyakumari and Nilgiris district is likely to see heavier spells of rains influenced by Orography. As things stand Chennai and rest of North Tamil Nadu is likely to come under light to moderate spells of rains as bulk of the rain bands will stay South of Pondicherry Latitude. 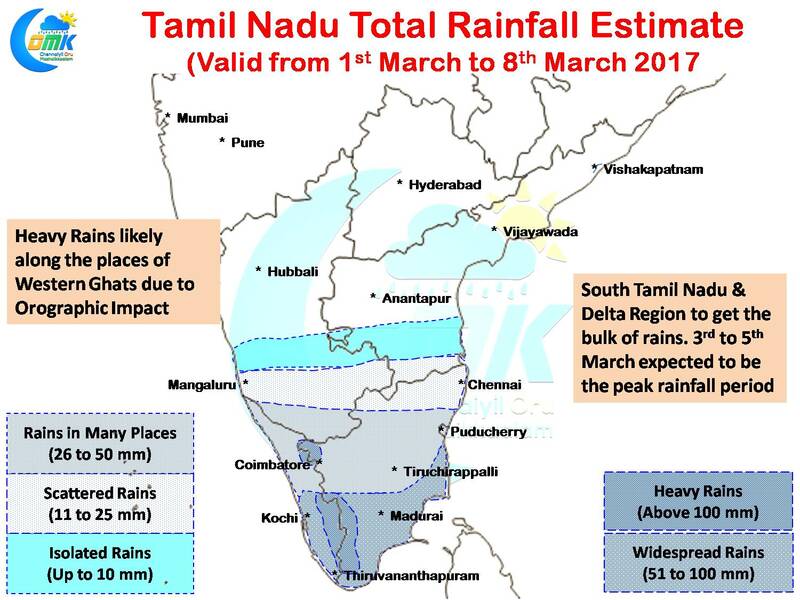 While the rains are likely to start for the coastal areas of South Tamil Nadu from early morning of 1st March the peak rainfall period will be around 3rd to 5th when the disturbance is possibly to the South of Tamil Nadu. On the temperature front most of Tamil Nadu is likely to see slightly below normal or near normal temperatures during day for the next few days while the nights will start to become warmer under the influence of the moist easterlies which will hold sway for the first week of March.